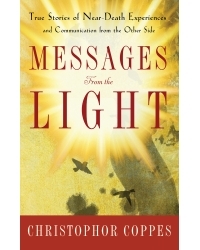 Messages from The Light makes clear that we are heading for a more wonderful future, but first we must realize that we have grossly neglected the spiritual part of ourselves and have focused too much on our own short-term self-interests. We have created a materialistic “I don’t care about you” society. When our physical body dies, our spirit will discover that it does not only belong to our material, four-dimensional world, but also to something that is so much greater, more wonderful, and more thrilling. In this “unity universe,” there are no lesser souls—we are all interconnected and connected to the Light, the ultimate unconditional love. Christophor Coppes holds a PhD in economics and has worked for many years in the banking industry. His interest in near-death experiences dates to 1979, when he read Raymond Moody’s Life After Life. A few years ago, he wrote a book in which he compares the essence of NDEs with those of five world religions. In 2008, he became president of the International Association for Near-Death Studies (IANDS) in the Netherlands. Christophor is a board member of the Society for Worldwide Dentistry and has participated in dental projects for underprivileged school children in Kenya and Cambodia. He lives in Amsterdam, the Netherlands.